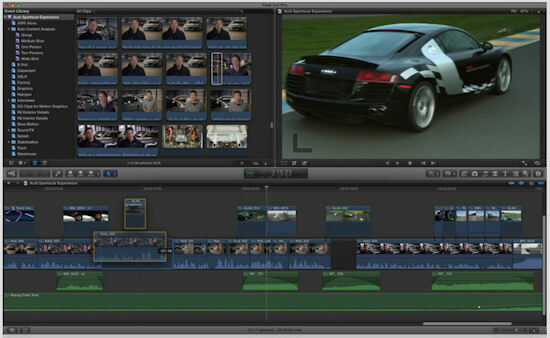 Apple has released its new Final Cut Pro X video editor, after a teaser preview at the NAB conference in April. And this is not just an update, or a re-engineering for 64-bit processing -- It's a complete rewrite and reinvention. Final Cut Pro X is priced at $299. Its companion apps are now available separately for $99 each: Motion 5 for professional motion graphics, and Compressor 4 for advanced media encoding. FCP X features some interesting new ideas in video editing (as well as some Apple-style rebranding of ideas previously seen in other applications). These include a new "Magnetic" Timeline which auto-adjusts as you arrange clips, Clip Connections to link related elements so they can move together, grouped Compound Clips, and Precision Editor to trim directly in the timeline. There's also an interesting Auditions feature to group alternative shots to compare different takes. FCP X also stresses media organization, with background Auto-Analysis on import to tag clip attributes for later searching and organization, Smart Collections based on search criteria, custom Range-Based Keywords that you can assign to a time range within a clip, and built-in Content Library Browsers. Then, not surprisingly, FCP takes advantage of the latest Mac hardware and software for real-time playback, starting with the completely rebuilt 64-bit architecture to work with larger projects, larger frame sizes, more frames in RAM, and deeper multilayered effects, Grand Central Dispatch for multi-threaded processing using all CPU cores, and GPU acceleration for real-time effects previews and rendering. But this is also a big change for FCP fans, as Apple seemingly refocuses on a less high-end, professional customer base, perhaps best demonstrated by the lack of support for importing old FCP files (although you can import from iMove). "Apple has followed the typical Apple sequence: (1) throw out something that’s popular and comfortable but increasingly ancient, (2) replace it with something that’s slick and modern and forward-looking and incomplete, (3) spend another year finishing it up, restoring missing pieces." So you can think of FCP X as a somewhat beta release of a significant new pile of software, with some shiny new stuff, major disruptions for current users, and promises and hopes for improvements to come. For more, also visit Creative Cow for reviews, discussions, and details on missing features. See full article: Summary: Apple Final Cut Pro X for more on the new features. Entries posted to Manifest Tech Blog in June 2011, listed from oldest to newest.